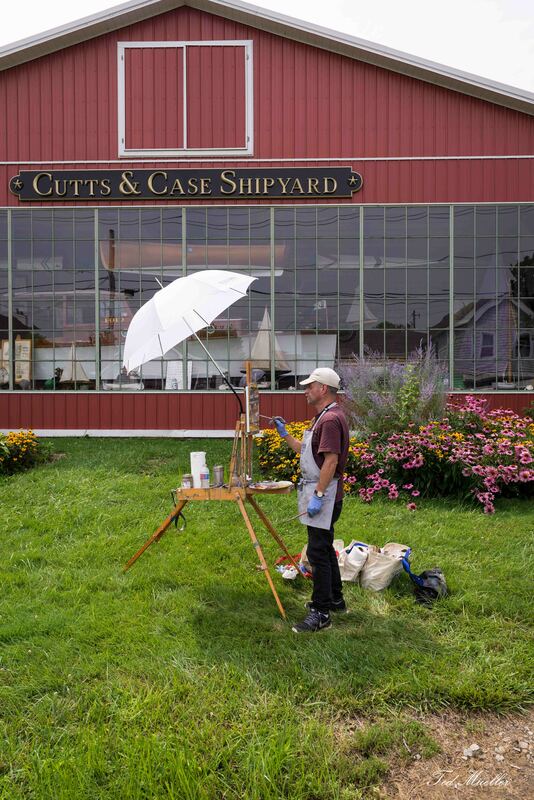 OCC: Plein Air: Oxford Paint Day | Oxford Maryland Vacations! Plein Air Easton artists come to Oxford – 15 July for the third annual Paint Oxford Day! The picturesque town of Oxford, Maryland will host 2018 Plein Air Easton artists throughout the day on Sunday, 15 July. This will be a great day in our watermen’s town, with artists painting at various historic and scenic places in Oxford. To mark this occasion, a full day of events has been planned for our locals and visitors alike. We hope your plans for the weekend include a stop in Oxford to watch this year’s Plein Air Easton artists paint one-of-a-kind scenes from the town and waterways. The Oxford Community Center is presenting this event in partnership with the Oxford Business Association. Sponsors this year include The Robert Morris Inn, Sandaway Suites and Beach, CaseWorks, Mystery Loves Company Booksellers, and Docs Sunset Grille. It will be a ‘family–friendly’ day, with activities for everyone. You can bring your pooch along, too; we even have a dog park not far from the OCC. Don’t forget a blanket or lawn chair to relax in the Oxford Park. For early risers, the Oxford Market will offer ‘free coffee with purchase of a muffin’ to start the day. A short stop away you’ll find the Oxford Museum open from 11 am to 4 pm. Outdoor activities during the day include watercraft rentals at the Strand from Dockside Boat Rentals, 1 – 5 pm. No visit to Oxford is complete without a ferry ride. Be sure to hop aboard ($5.00 per pedestrian) and traverse the Tred Avon River to enjoy the scenery. The ferry is an iconic landmark not only in Maryland, but on the entire Eastern seaboard. If this is your first visit to Oxford, we invite you to a walking tour of Oxford. Meet at the Ferry Dock at 10 a.m. and join Oxford resident Leo Nollmeyer for an enlightening history of our town. If you are walking about town, pick up a Picket Fence Map and locate this year’s 15 great fences created by local artists. These are auctioned off in October so if you find one you like, let us know and we can put in a proxy bid for you if you can’t make it back this fall. Popes Tavern will be serving Sunday Brunch from 11 am -2 pm. Be sure to make your reservations! If you are thirsty later on in the day, stop by the Treasure Chest from 10 am to 4 pm; free lemonade will be available from the stand out front. You are sure to find a variety of unique gifts and artwork inside, as well. Oxford is also home to Mystery Loves Company Booksellers – a truly special bookstore located conveniently next to the Oxford Town Park. To mark the occasion of the Third Annual Paint Oxford Day, author Dana Kester-McCabe will be on-site (1-3 pm) and signing copies of “the Delmarva Art School,” appropriately set on the Eastern Shore, of course. Be sure to take a stroll down Tilghman Street to the Scottish Highland Ice Creamery, which will be open from noon until 8:30 pm. They will feature a special “Plein Air Sorbet” as well as several other original and tempting flavors of the day. While you watch the artists at work around town, you’ll no doubt notice a variety of painted picket fences prominently on display. Be sure to pick up a Picket Fence Map at local business locations, and stroll through town to view another form of original artwork. There are 15new picket fences this year, as well as several others from years past. Toward the day’s end, head on over to the Oxford Community Center, where you will hear local Oxford musicians jamming to some of their favorite tunes.. Then go inside to see the artists’ completed, framed accomplishments. Paintings may be on display as early as noon for viewing and purchase, but the full Artist Exhibition (accompanied by nibbles and beverages) will be there from 5 to 6:30 pm. Capping off activities at that venue, the President of the Oxford Community Center will announce and present the coveted Artists’ Choice award around 6:15 pm.